High quality waterproof LED Tactical Flashlight with high intensity brightness and range. This is the best flashlight for outdoor activities, emergency, camping, hiking, fishing, and standard household use. * LED Lifespan: 100,000 hours. * Powered Source : Flashlight Support 1PCS 18650 Battery or 3pcs AAA battery. 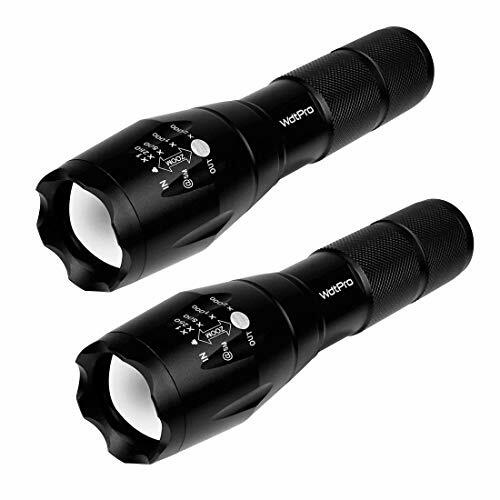 ULTRA BRIGHT: WdtPro High lumens flashlights use high-efficiency and great output LED chip, 50% brighter than basic LED flashlights. Always bright with 100,000 hours Life Span. HIGH PERFORMANCE: Made of high quality aluminum alloy and rubber; Anti-abrasive, drop-resistance and compact design makes it the best tactical flashlight for use around the house, camping, hiking, dog walking and emergencies. ADJUSTABLE FOCUS AND FIVE LIGHT MODES: Similar taclight as seen on tv - 5 adaptable settings(High, Medium, Low and etc.) and can be focused from a wide beam to a narrow beam. Also with a comfortable and durable wrist strap for handy use. WATERPROOF AND COMPACT: IPX6 Waterproof level, WdtPro flash light can waterproof from splashing water from any angle and heatproof. You can take these flashlights anytime and anywhere, small enough to fit in your pocket, handbag, tool box, drawer or car compartment. POWERE SOURCE: Included 2 tactical flashlights. Powered by 1 * 18650 lithium-ion battery or 3 * AAA batteries (batteries are not included). Our flashlight offer 2 years warranty and money back service. No Risking for Purchasing! If you have any questions about this product by WdtPro, contact us by completing and submitting the form below. If you are looking for a specif part number, please include it with your message.